Merchandising. Forget that the Ninja Turtles had a TV show and a few movies, they made their sweet bucks selling a haul of silly goods. A typical day for a kid in the 90's was surrounded by the madness at every turn. 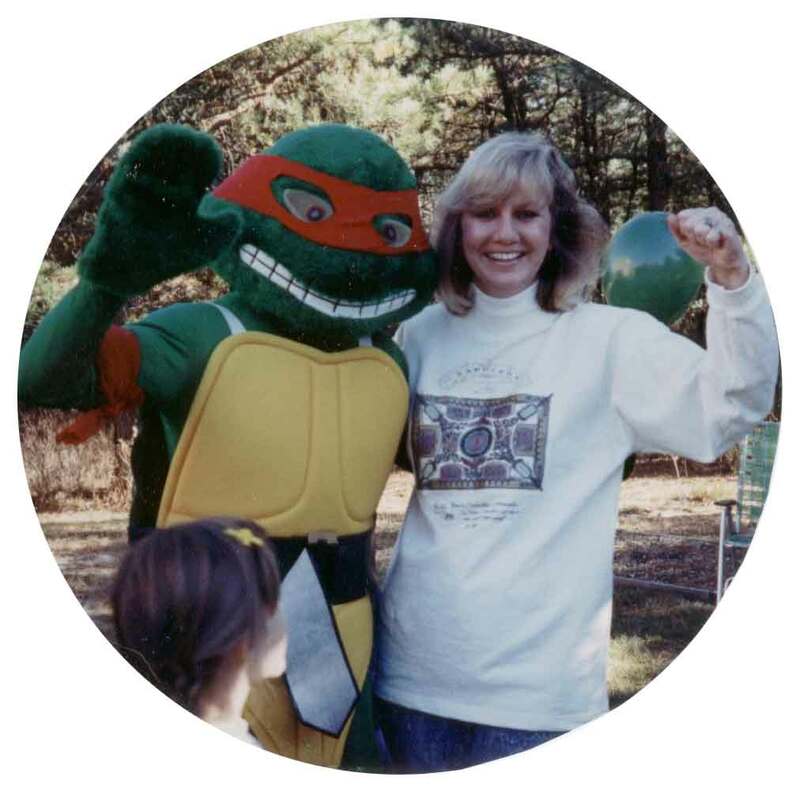 You woke up in your green pajamas, followed by a bowl of nutritious Ninja Turtles Cereal for breakfast, then off to school with your TMNT-themed lunchbox, eventually returning home to eat dinner off your Raphael plate, and then finally you would find yourself drifting into sleep between your comfy Ninja Turtles bedsheets. It was fun for sure, but to the parents it must have been exhausting. What started out as four simple figures, has evolved into a collection for the ages. The original toys, a line from the movies, special edition releases, the relaunch in 2003, comic book-inspired figures - the list is never ending. And with such a massive assortment of toys in my arsenal, the question always pops up - "do you have a favorite???" Yes, I do have a favorite. One small purchase in 1992 eventually became the ultimate purchase of my Ninja Turtles universe. This one particular toy managed to score the majority of my playtime. But before I reveal which figure gets the crown for Number 1, let's check out 9 other action figures that I found fascinating as a kid. I'm sticking to one simple guideline - they can't be human. So April, Casey, and any people in between, sorry, you won't be on this list. This dude is aggressively cool. Decked out from head to toe in elite Mutant Military fatigues, this soldier means business. Raph, The Green Teen Beret almost has a weapon strapped to every limb. A few knifes and a holstered gun make up his arsenal. Still not convinced this Turtle is tough? The back of the packaging card provides a little more insight to his raw power - stating his favorite weapon is his "bare hands"?! The Turtles always got a lot of unjust flack about violence…and this figure doesn't help their cause. But, maybe that's why he appealed to me as a kid. He wasn't as wholesome as the rest of the lot. Those solid, white eyes that were normally so friendly seem cold and distant with Raph, The Green Teen Beret. He was a man on a mission. A mean mission. Although this toy was probably made in China, he is an all American hero. Waving red, white, and blue high in the air, Raph, The Green Teen Beret shows his love for the USA. I'm not sure if this "Mutant Military" line of figures were released in conjunction with the Fourth of July, or if was just to cash in on the G.I. Joe toy market, but either way I enlisted on that purchase. God Bless America (and the Turtles). Purple pistols. How could you not love playing with a Turtle that had not one, but two (!!! ), purple pistols?! Factor in some style from the Wild West and you've struck gold. From wardrobe to demeanor, Crazy Cowboy Don is a complete 180 compared to our pal Raph, The Green Teen Beret. What's funny about Crazy Cowboy Don is that he's actually not so crazy. Really, he seems pretty calm and collected. He's got a small drinking straw propped stylishly in his mouth. He is reminiscent of Paul Newman in the film, Cool Hand Luke. His usual threatening Turtle grin wouldn't scare a fly. It's pretty reserved. So, why the Crazy Cowboy Don name? I guess naming him Calm and Collected Cowboy Don just doesn't sell as many toys. Not sure if he fought foes (or worked on a…eh, dude ranch? ), but this cowboy has the prefect wardrobe. Slick black boots and a crisp pair of denim jeans. Also, did I mention how much I love these purple pistols??? As a kid, the guns with their holsters really caught my attention. I was never a fan of the Turtles using guns, but this one somehow snuck in there. Their color surely made them less intimidating and Crazy Cowboy Don's visual was so lackadaisical that I never perceived them as a violent weapon. Just simply a prop for a calm and collected cowboy. Nauseating, hideous, and utterly repulsive. The only words to describe the villainous Pizzaface. But, that's also why I love this mutant so much! As a kid, I found him fascinating, while he urked my Mom beyond belief. From the sauces and slimes oozing from his mouth, to the simple fact that he has poor hygiene, my poor Mom refused to accept this guy as part of the TMNT universe. So, I thank you Dad for making this purchase. Pizzaface may look like human, but he is far from it. What is he? Half man, half pizza. As wild as that sounds, it's the truth. His backstory is completely absurd and seems like an idea hatched by a five year old. According to his packaging, his backstory reads, "Pizzaface had a plan to become the most powerful pizza chef ever, So he zapped himself with retromutagen in his oven - hoping the energy would bake him into badness." Geez. They paid someone to come up with that concept? Fingers crossed it was an intern. Pizzaface comes with more toppings than a pie with the works. His interchangeable leg is what gives this culinary creature an edge over some of the other mutants on this list. His primary weapon also acts a limb. What kid could complain about that? Anyway you slice it, Pizzaface is one of my top chef. These two have got a fun backstory. But, does it really even matter? Visually, Muckman & Joe Eyeball are so wildly silly that any kid could create an imaginative backstory for these goons. Everything about them is drenched in fun. Their faces somehow manage to encapsulate a little charm despite their overall grotesque visual. For plastic action figures, Muckman & Joe Eyeball even look like they are having fun here. Muckman's small sidekick, Joe Eyeball, is weirdly cute too. His long, floating eyeballs add to his strangely adorable vibe. Look, he's even waving a delightful, little hello. While not quite as pretty, Muckman is still a unique creature himself. Along with worms and a frog, his body is covered in holes. Normally this would be a big handicap for a person, but not for good ol' Muckman. Instead, this feature allowed kids to pour Ninja Turtle Ooze all over him, creating spots where the slime could seep through. A weird idea for a toy, but brilliant for kids loving the theatrics. He's a boss - laughing at the law, blasting his loud noise, and rockin' a yellow keyboard. Punker Don is the definition of 90's cool. From his bright wardrobe to his crazy mohawk, he's against all authority. The dude even ripped off one sleeve of his leather jacket! The yellow keyboard also sucked me in. I didn't have, and still don't have, any musical talent. As a kid, for some reason I thought this instrument was meant for me. That I would magically be able to play this enchanted yellow keyboard. I wanted to slide my fingers across those ivory keys and make some sweet tunes. Of course this will most likely never happen in my lifetime, but I can pretend with my pal, Punker Don. I know, I know - the third Ninja Turtles film is a train-wreck. BUT, the line of action figures were pretty stellar. Glorified samurai toys with a little TMNT thrown in the mix is a solid win. And to be honest, these figures actually look better and more realistic than the Turtles in the movie; which is pretty sad. Lost in translation are the goofy eyes, terrible mouth movements, and the overall cheap costume work. And the best selling point, you didn't have to stick to the plot of the movie (zing!). Even as a kid, I could come up with a better storyline than that atrocity. One of my favorite aspects of Movie III Samurai Raphael are his accessories. The act of deception and disguise was intriguingly fun as a kid, making his removable mask the best feature. On, off, and back on again, I would play with this samurai Turtle for hours. The scepter was another heck of an accessory. Since the movie put such importance on this prop, I felt the same weight applied in my self-created stories during playtime. Heroes and villains battled against each other for this small, gold, cheap piece of plastic. Spoiler alert, the Turtles always won. Okay, I know he's human and I said no humans would make this list. BUT, he's super human! He's mutated! Up until this figure, there never was a great Shredder toy. The previous attempts all boasted a silly, cartoon likeness. But, not this one. Not big, mean, and mutated Super Shredder. He came with a canister of ooze too - similar to the ones featured in the film. Not sure why, but as a kid I loved this thing. It quickly became the quintessential maguffin in my playtime Ninja Turtle tales. Unlike my love for the ooze, I was always disappointed with Super Shredder's helmet. It was so tame compared to what was on display in the film. Gone were the jagged points and over sized fit. I guess the good stuff is too dangerous for kids. "Sugar and spice and everything nice - that's what little girls are made of. Snips and snails, and puppy dog tails - that's what little boys are made of." This classic nursery rhyme basically translates to "boys are gross." Mutagen Man is gross by all accounts, so naturally all boys loved this guy. He resembled a giant, dirty fish tank with a few decaying limbs attached. You could also see his guts, and kids really love that word - guts. Mutagen Man was once a normal nerd of a dude, Seymour Gutz. His story is equally as tragic as his appearance…and at the same time half of his appeal. The poor fellow fell into some ooze and his body melted away. He preserved his vital organs in a clear tank with his rotting limbs clinging on. Seymour lost his head too, resulting with his eyeballs, brain, mouth also floating amongst his guts. A sad story indeed, but it makes for a heck of a toy. With a little bit of water, you could fill Mutagen Man's tank up and see his organs float (along with a few random items that I've lost along the way, like a fish, wrench, and a chicken bone). He's basically a disgusting diorama of a science project with some arms and legs. And he's one of my favorites. Love those guts. This dude came out in 1994, which was the beginning of the end. The Ninja Turtles had reached their height in popularity in the early 90's, so at this point they were slowly retreating to the sewers. But for an eleven year old kid, this toy was long overdue. Krang - he was a quintessential TMNT character. The brain-like creature had a couple of toys in the early days, but the proportions were never correct. He always seemed a tad too big in comparison to the other toys. In the cartoon, he wasn't much taller than everyone else. So when this version of Krang was finally released, I was a happy camper. He finally made sense in my world of TMNT playtime. He matched the other toys in size and was the perfect villain to let my imagination soar. Unfortunately, as the TMNT craze started dwindling down, I too was losing hope. The toys were being released less frequently and the episodes of the cartoon were lacking substance. But, this version of Krang put a little wind back in my Ninja sails. I fondly remember getting this guy during my last wave of Turtle toy purchases. If anything, I give this Krang figure a lot of credit for continuing my TMNT playtime a bit longer. My Super Shredder toy was a couple years old and losing some appeal. Luckily, Krang, a villain, came in and saved the day. One toy to rule them all - and here he is. Movie Star Raph, the king of playtime. What makes this figure so special to get the status of Number 1 on this list? Simply put - everything. First off, he was from the movie. The comics and television series were great, but it was that first movie that really allowed the Turtles to shine. The two times I saw it in the theaters (as a kid) were legendary. Followed by hundreds of repeated viewings that eventually ate away the entire picture on the VHS tape. So, when the Movie Star Raph toy hit store shelves, you bet your shell I was excited. And although he was not a perfect replication of his image on the silver screen, he was close enough. A long, wavy bandanna, battle scars, a belt without a gimmicky "R" on it, and even the texture of a real-life turtle. The majority of his body is also made up of rubber pieces rather than the plastic that was used on the previous line of figures. To me, this made perfect sense. The guys in the movie were in giant rubber suits, so why not make the toys rubber too? The flexible limbs and head allowed for fun opportunities when playing that the plastic figures just didn't allow (like popping their heads off!). A sad day struck when I returned home from school to find this mangled mess on the floor. No, the dog didn't eat my homework, but he did eat my Movie Star Raph. Our mangy mutt, Cheerio, tore into my TMNT collection. Movie Star Raph was the only Turtle to take a hit. For a few weeks after that, Cheerio wasn't man's best friend. This unfortunate event took place years after Movie Star Raph was available on store shelves. His heyday had passed and new waves of Turtle toys were on the market. Trying to replace him seemed impossible. But, Movie Star Raph was destined for a comeback. Who would come to the rescue? 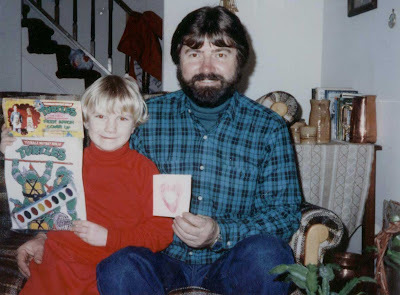 It was my Dad who wore the superhero cape that day. He somehow managed to find a brand new, still in the box, Movie Star Raph. This was before the days of eBay - so how he conquered this task is still a mystery to me. But boy, am I glad he did track down another Movie Star Raph. Number 1 keeps his crown. That's the 12" version of Krang's Android Body, and that did come out in 1991. But, the one I was referring to in my post was released a few years later (and a lot smaller in size). And thanks for that link - it's super fun! The 12" version of Krang's Android Body came out in spring of 1992. It was made in 1991, though. Heck of a list and a lot of great characters included! Sorry to hear about the death of Raph but those movie star turtles and their rubbery hides are irresistible to canines.